We all head to conferences with this rosy vision of how THIS TIME we’ll find that silver bullet, that essential piece of info we can cart home and use to solve all our association’s problems. Then WHAM! I don’t know if it happens on the trip home, or when we return to the hectic pace of the office, not to mention the backlog of work waiting for us there, but suddenly… blip! 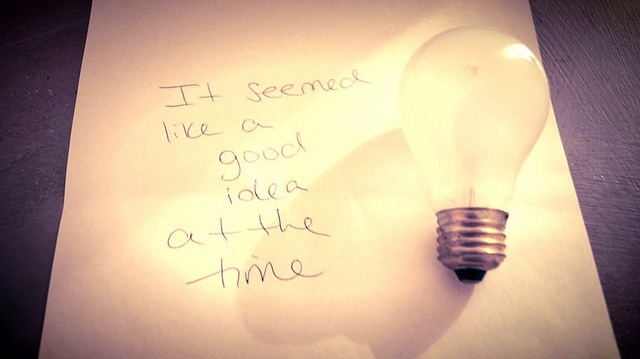 Your brilliant idea… it’s gone. Fear not, intrepid travelers, help is here. Since 4 brains are better than one, I joined Lisa Van Gemert formerly of American Mensa; Trevor Mitchell, then at ARMA International, now at American Mensa; and Lauren Hefner formerly of Healthcare Businesswomen’s Association for a session at ASAE’s Great Ideas Conference on turning ideas into action. Today, I’m sharing a few of our insights on how you can take what you learn at your next conference and actually retain and use it when you get back to the office. You go onsite to the meeting, you take copious notes—pages and pages of notes in your tablet, phone, notebook, or assorted hotel notepads. You stow away handouts in your conference tote, along with exhibit swag. You feel pretty good about yourself with your Einstein-rivaling brain full of awesome ideas. Then, if you’re anything like me, as you fly home you’re still buzzing from all the ideas you continue to capture on cocktail napkins, supremely confident that things are going to be different this time! The next day, back in the office, you open your email. Oh look, 847 unread messages… WHAT?!?! You file your precious notes and handouts in a special folder that you intend to consult daily. Your computer dings: meeting in 15 minutes. Bummer. A glance at your calendar deflates you further: meetings, conference calls, and more meetings fill up the coming days. You no longer feel much like Einstein. This is how it typically goes for many of us. However, Lisa made a conscious effort to change the way she approached conferences by planning ahead, making all the difference in the world, and now her ideas work for her (instead of languishing in some forgotten file). Trevor took a slightly different approach. He primed himself before the conference to identify potential exercises he could bring home and apply to a specific issue he wanted to solve. Then, ideally, he’d help fellow staff members better understand the issue as it applied to key projects. Although he found a session he thought would be great at helping him explore this issue with his colleagues, the format as presented didn’t really fit the circumstances at his organization. So what did he do? He took the main idea of the session (in this case, the PM PokerTM approach) and altered it to work back at his association. This tactic provided just what he needed to take what he learned and apply it effectively at home. It’s just this type of flexible thinking that event attendees should employ to get the most out of conference content. To get more value from the ASAE conferences she attends, Lauren has a game plan: the “rule of 3” method. This framework allows her to focus her efforts and achieve measurable results. Rule #1: Get answers to 3 questions. On the plane there, make a list of 3 questions you want answered or 3 takeaways you wish to bring home. The goal is to get those questions answered by the end of the conference. Rule #2: Go home with 3 immediately actionable items. Seek to go home with 3 actionable items you can use that first week back—not things that create work, but things that are helpful. Lauren often Tweets these actionable items during the conference. These Tweets masquerade as helpful tips for the association community; but, in fact, they’re really notes to herself that she can revisit when putting them into action back home. If you don’t have an actionable to-do, Lauren recommends listening for things your colleagues may be able to use—think outside your own area of responsibilities if you must. Rule #3: Make 3 new friends. Lastly, Lauren suggests that you plan to walk away with at least 3 new contacts you can immediately add to your network in a meaningful way—not merely as a LinkedIn buddy. These are folks who have something you need, have a need you can fill, or would be a good mentor or friend. The usual conference m.o. is meeting dozens of people at a conference, collecting a pile of business cards, and adding them to the pile of faceless names from 2 years ago. You’ll never talk to these people if you don’t remember them. Instead, every night during the conference, Lauren sends emails or connects on LinkedIn to new acquaintances. She reminds them of their discussion and suggests a plan to have a call or coffee in the next month. Some of these new acquaintances have become friends because she makes it her goal to collaborate with them, not just connect with them on LinkedIn. And that’s how Lauren ended up doing this session with me. Create a personal plan of attack. No matter how you choose to approach it, lay out some strategy for how you wish to get the most out of the many benefits that the ASAE Annual Meeting & Expo has to offer. Planning ahead is the key to making it a meaningful experience—one that actually helps you do your job in the future.